The New Jersey state seal identifies government buildings and officials and is a centerpiece for the New Jersey state flag. The symbolism, history and emblems of the New Jersey seal are described in this article with fast facts. The top of the design is a crest of the head of a horse. The horse head symbolizes speed and strength and is the New Jersey state animal. The gold, barred front facing helmet (a symbol of royalty in heraldry) which represents sovereignty for a state that governs itself. The New Jersey state statute, describing the general rules of construction of the seal, directs a mantling of argent and azure. A mantling is a heraldic term for the drapery or scrollwork generally tied to a helmet above or around a shield. Argent means silver and azure means blue. The female figure pictured on the left is Lady Liberty, carrying the liberty cap on her staff. The pileus, or Phrygian cap was said to be worn in ancient Rome by slaves who had won their freedom. Ceres, the Roman goddess agriculture and abundance is on the right. She holds a cornucopia, the horn of plenty, filled with harvested produce symbolizing abundance. Her name originates from the Latin word 'Cerealis' meaning "of grain" from which we derive the modern word 'cereal'. The shield on the seal with three plows on it show the importance of agriculture to the state's economic power. 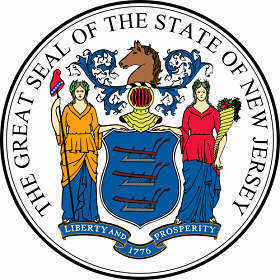 The New Jersey seal is kept and used as required by the Constitution and laws of the state. This is an early flyer depicting the 1876 design of the New Jersey seal which has many similarities to the current version. The pictures surrounding it are interesting as they convey elements important to the state. The invention of the steam engine was critical to the modern railroad and trains. 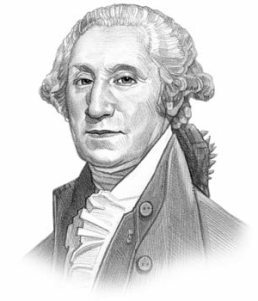 Colonel John Stevens is considered to be the father of American railroads and in 1826 Stevens demonstrated the feasibility of steam locomotion on a circular experimental track constructed on his estate in Hoboken, New Jersey, three years before George Stephenson developed a practical steam locomotive in England.